When Apple seeded the first OS X Mavericks 10.9.2 beta build to developers on Thursday, it was discovered that FaceTime audio had been quietly integrated into the Messages and FaceTime apps, suggesting the company will soon bring its first-party VoIP solution to the Mac. According to people who have used the new FaceTime audio for Mac, Apple has seamlessly integrated the voice over IP service into both the FaceTime app and Messages, complete with the usual graphical user interface and easy access to contact information. As seen in the screenshot above, the UI itself is spartan, with an audio levels indicator, talk time, and call/end button accompanying a contact's name and avatar. 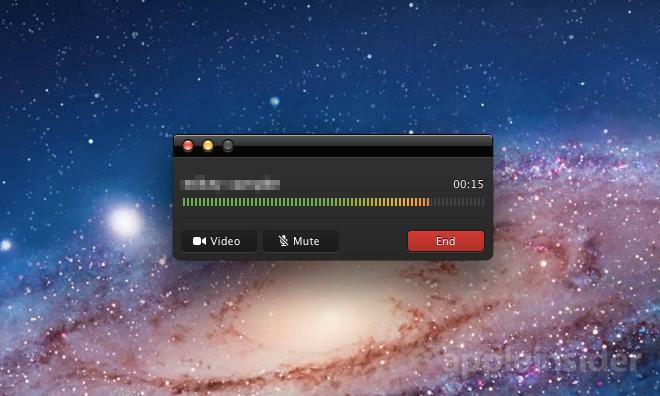 During a call, users now have the option to switch between audio and video modes via a new button next to the mute switch. In the beta, access to audio-only FaceTime calling can be accomplished through the FaceTime app as well as directly from Messages. Seen below, Apple has integrated a call button with a phone icon next to the FaceTime video's camera icon at the top of every Messages window. Currently, the iOS implementation of FaceTime audio delivers a better-sounding call, say people familiar with the service. When making calls in certain environments, some noted poor audio quality, with artifacts and substantial echo heard on the receiving end. The issues are most noticeable when first establishing a connection, but usually stabilize after a few seconds. Any existing bugs will likely be worked out in future builds and it is possible that Apple will fine tune the dual microphone setups in current Mac hardware to deliver higher fidelity audio than presently offered in FaceTime video calls. With FaceTime audio possibly showing up in the public version of OS X 10.9.2, users will have yet another VoIP option to choose from. A number of messaging services already have voice calling on offer, and Skype has been a long-standing dominator in the sector. But a built-in turnkey solution from Apple would no doubt be an attractive alternative, especially given the company's installed iOS user base.